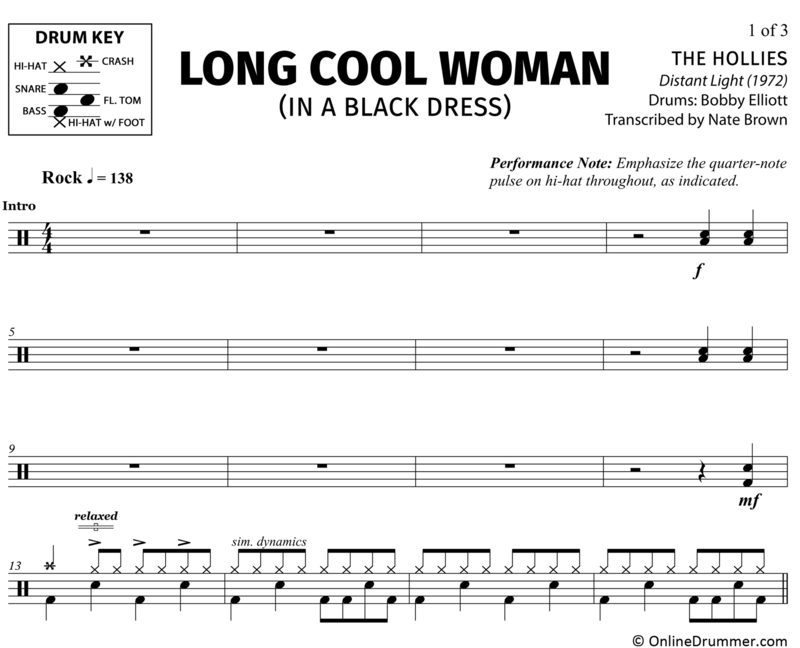 The full drum sheet music for “Long Cool Woman (In a Black Dress)” by The Hollies from the album Distant Light (1972). This ’70s rock hit is a fun-to-play song with a moderately fast tempo that will keep you moving. Most notable in Bobby Elliott’s drum part are the hi-hat dynamics, placing an emphasis on the quarter-note pulse to drive the 1, 2, 3, 4. During the beginning of the song, the quarter-note pulse is less emphasized, but following the “re-intro” the quarter-note emphasis becomes very pronounced (as notated in the sheet music). Elliott drops the 8th notes on the hi-hat altogether in the outro, instead playing straight quarter notes to drive the song home.